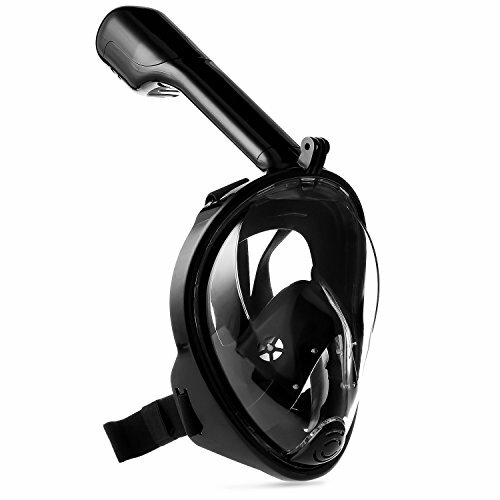 PANORAMIC LARGE VIEW: 2-in-1 mask and snorkel offers a 180° field of vision for beautiful underwater adventures, with shatterproof tempered glass lens for extra safety, adjustable head straps for a clearer and wider sea view. EASY BREATH, ANTI FOG & ANTI LEAK: Stops salt water from getting into your mouth and prevents gagging. Spending less time worrying about water in your snorkel set and more time snorkeling and enjoying your wonderful diving experience. SPORTS CAMERA COMPATIBLE: With detachable sports camera mount, you can easily attach your action camera and capture amazing things as you\'re snorkeling! Perfect for recording your cherish underwater moment. GREAT GIFTS & VACATION IDEAL: Easy to wear and breathe freely, not only for experienced swimmers, also good for beginners. Our full face snorkel mask make snorkeling easier and more comfortable, best gift for beginners, friends and parents. Take this unique snorkeling mask with your family to enjoy the vacation, enjoy the life. SATISFACTION GUARANTEE: If you are not 100% satisfied with our diving mask, please feel free to contact us, we offer a 30-day hassle-free refund and welcome all your constructive suggestions.